Joanie's Classy Card Corner: Can you smell the apple pie baking? I am making the post for Fresh Brewed Designs for their Challenge #115 Photo Inspiration, which are apples. So here is dear old Granny getting her apples ready to bake an old fashioned apple pie. YUM!!! 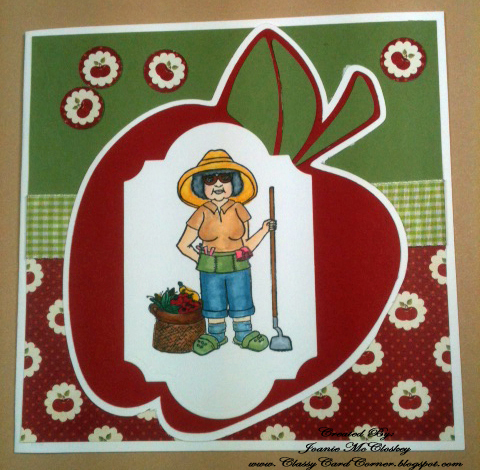 The stamped image is from Fresh Brewed Designs and it's called "Gardening Granny", she looks really cute in her jeans don't you think? ; ) Well, I hope she gets going soon, I sure could use a Fresh Brewed cup of coffee and a big slice of Apple Pie.